While you're relaxing on the sofa with the television on, obviously you're not going to be watching it, because you'll have a smartphone, tablet, notebook, or some other electronic device in hand drawing your attention instead. The problem is keeping that device charged. Forget the nightly struggle to plug assorted charging cables in behind the couch and simply keep your devices charged through this cool new Device Charging End Table. This stylish wooden end table has a discreet charging station built-in underneath a clever hinged lid that includes two standard power outlets and two USB charging ports. It even has a handy pull-out tray and a drawer to stash those unsightly cables when not needed. If you hate cable clutter and are addicted to staring at screens of all sizes, look no further. 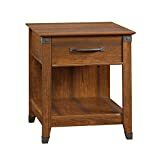 Sauder 413350 Carson Forge Smartcenter Side Table L: 22.09"